The Zion Corridor—also known as the Zion Scenic Byway—consists of Utah Highway 9 for 65 miles from St. George to Mount Carmel Junction before ending at US 89 between Bryce Canyon National Park and Kanab. The scenic highway wheels through five western towns, including Springdale, a pioneer town that serves as the gateway to Zion National Park. The road’s section through Zion is your passport to breathtaking scenery, superb hiking trails, wild canyoneering trips, impressive rock climbing routes, and inspiring viewpoints. While it’s easy to drive the route in a couple hours, plan on spending at least a day to explore the natural wonders and diverse adventures along Zion’s canyon corridor. The first segment of the Zion corridor runs almost 40 miles on route 9 from St. George and Interstate 15 to Springdale and Zion National Park. The highway dips across the Virgin River and passes two excellent state parks—Quail Creek and Sand Hollow. Both offer warm water, gorgeous red-rock scenery, trophy-sized fish, and lots of recreational opportunities, including camping, boating, hiking, cliff diving, and beaches for swimming and sand castles. After swinging through Hurricane and La Verkin, the road bends east and follows the twisting Virgin River up a canyon lined with dusty bluffs and cliff-rimmed mesas. Once you reach Virgin, take a side trip by getting off Utah Highway 9 and heading north on Kolob Terrace Road, one of Zion’s best scenic drives. The winding road climbs north for 25 miles to Kolob Reservoir, passing bulky sandstone mountains like the Guardian Angels and Pine Valley Peak. You’ll find access to the famed Subway, one of the park’s classic canyoneering trips, and Lava Point, a lofty overlook perched above a maze of canyons. Getting back on Highway 9, you will continue east from Virgin to find excellent mountain biking at Gooseberry Mesa and Guacamole Mesa and hiking on Coalpit Wash and Eagle Crags Trails. Turn south in Rockville to explore the ghost town of Grafton, first settled by Mormon pioneers in 1859. Now the haunt of owls and lizards, the silvered wooden buildings were the movie set for Butch Cassidy and the Sundance Kid. The Smithsonian Butte Backcountry Byway, a nine-mile scenic drive, bumps across the historic Rockville Bridge and winds south to breathtaking views from the base of the butte, a serrated coxcomb of rock buttresses, across Zion’s canyons. The town of Springdale is where most people stay when visiting Zion National Park. Springdale, the gateway to the natural wonders of Zion National Park, lies midway along the Highway 9 corridor at the southwest entrance to Zion. The compact town, one of southwestern Utah’s oldest settlements, opens its arms to most of the park’s 4.5-million annual visitors. In the evening, Springdale welcomes Zion’s adventurers back to civilization after they’ve spent their days exploring stunning scenery—hiking up Angel’s Landing or The Narrows, squeezing down slot canyons, and snapping Instagram-worthy photos from Observation Point. Springdale makes an ideal base camp to explore the Zion corridor along Highway 9 with easy access to the area’s natural wonders and outstanding recreational opportunities. If you want to explore Zion Canyon in the busy season, Springdale makes it easy to leave your car at the hotel and ride a free shuttle to the park visitor center and museum where you can catch the Zion shuttle. The Old West town dishes up plenty of excellent food with more than 30 restaurants. Order a pint of locally brewed beer and pub food or sample tasty establishments serving steak, seafood, Thai, Mexican, vegan, and innovative café cuisine. Favorite restaurants include the Bit & Spur Restaurant, Café Soliel, Oscars, Zion Canyon Brew Pub, Switchback Grille, and Spotted Dog Café. At the end of the day, Springdale is the perfect spot to rest your head on a pillow for tomorrow’s adventures. 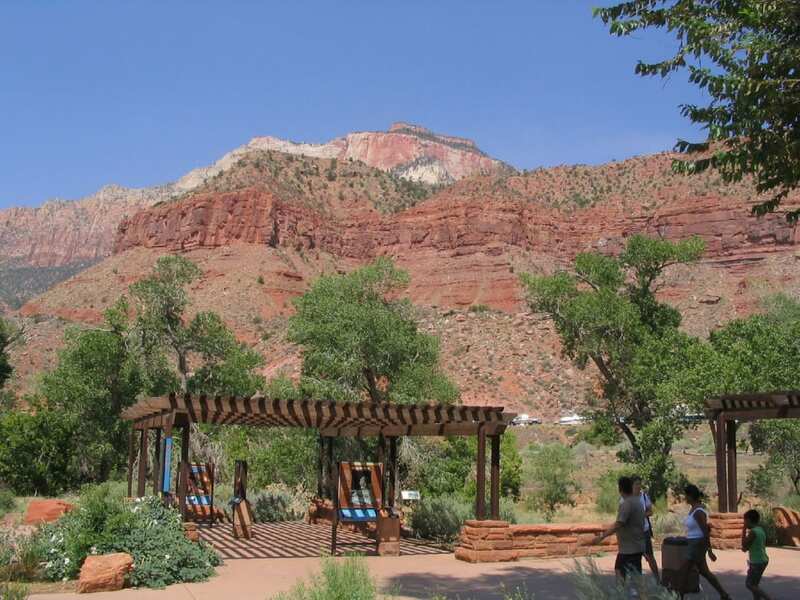 The town’s diverse accommodations include hotels, lodges, bed and breakfast inns, luxury resorts, and campgrounds with a view in Zion National Park. Remember to reserve ahead during the busy season to find the best lodging options. Recommended hotels include Flanagan’s Inn, Desert Pearl Inn, Cliffrose Lodge, and Cable Mountain. Besides offering essential services, Springdale is also perfect for roaming with eclectic shops, art galleries, the O.C. Tanner Amphitheater for concerts, and a rugged skyline overhead. 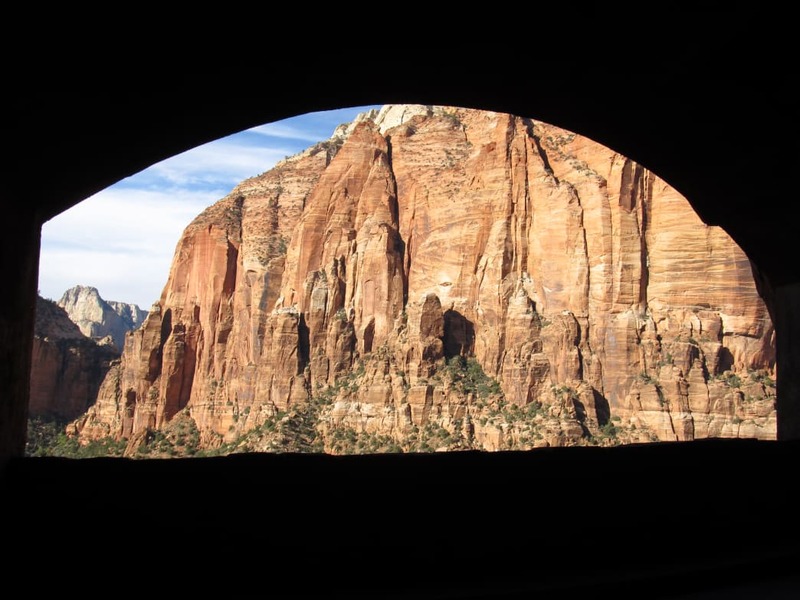 The 1.1-mile Zion-Mount Carmel Tunnel opens up the east side of Zion National Park. Past Springdale the highway enters Zion National Park. After the entrance station is the Zion Canyon Visitor Center, which dispenses valuable information about the park and serves as the station for the free Zion Canyon shuttle, which runs from March through November. Stop at the Zion Human History Museum across the street for information and exhibits about the area’s natural history, geology, and human history. The highway heads north and crosses the Virgin River to its junction with the Zion Canyon Road, which is closed to private traffic most of the year. To visit the canyon and its iconic sights and hikes, take the park shuttle up the canyon or rent a bike in Springdale and use pedal power. Route 9 swings around towering Bridge Mountain and follows the floor of Pine Creek Canyon before switchbacking 800 feet up steep slopes to the famed Zion-Mount Carmel Tunnel. This 1.1-mile-long tunnel, chiseled through sandstone cliffs, is an engineering marvel completed in 1931, opening easy access from the east to Zion Canyon. Past the tunnel, park at the trailhead for a one-mile round trip hike on Canyon View Trail. The easy footpath ends at a dramatic overlook into lower Zion Canyon and beyond to the soaring walls of the Towers of the Virgin. The trailhead is also the starting point for the Pine Creek technical canyoneering route. The subterranean adventure, for experienced canyoneers only, descends a narrow slot canyon with six rappels, downclimbing, and swimming in cold water. The highway twists east in Clear Creek’s deep canyon. High, rounded domes loom above the blacktop, including Ant Hill, South Ariel Peak, and Aires Butte, its flat summit reached by a moderate climbing route. Checkerboard Mesa, characterized by criss-crossing cracks, rises above a viewpoint off the road. Ten miles from the road junction in Zion Canyon, UT 9 reaches the east entrance station to Zion National Park. The superb 11-mile East Rim Trail begins here and climbs onto the wooded East Rim before descending to Weeping Rock in Zion Canyon. Take a short hike up the trail for wondrous views of eroded canyons and gleaming sandstone peaks. Past the entrance station, continue east for 13 miles through open valleys rimmed by cliffs to the end of Zion’s Highway 9 corridor at Mount Carmel Junction. Turn left to head toward Bryce Canyon National Park or right to reach Kanab. No matter if you’re doing a small section of the route—or the whole thing in the winter months—you’ll find an unforgettable road trip that highlights the best of this corner of Utah. Take your time, and you can fill our days with endless outdoor adventure along the way. Written by Stewart Green for Matcha in partnership with Zionnationalpark.com.